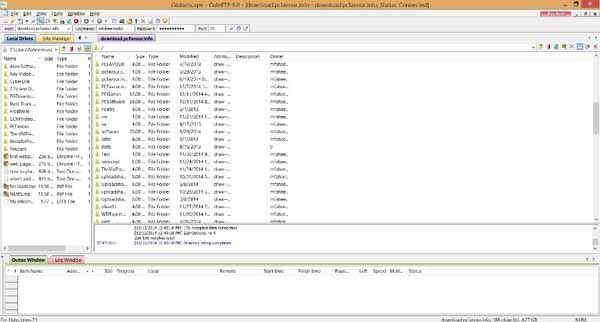 Free download CuteFTP latest version. CuteFTP is a series of applications FTP (file transfer) developed by GlobalSCAPE since 1996, both with an interface based on Windows or Mac based and made for both home and professional use. CuteFTP is used to transfer files between computers and servers File Transfer Protocol (FTP) to publish web pages, download digital images, music, software and multimedia files, and transfer files of any size or type between home and office . Since 1999, CuteFTP CuteFTP Pro and Mac Pro have also been available with CuteFTP Home with free trial periods. Originally developed by Canadian Alex Kunadze. If you want to upload a file, you can locate it using left side bar from the software CuteFTP and select it. You can also drag and drop it into the folder or directory on your server in which you want to upload it. After uploading, you can get the download link by right clicking on the file. This will copy the ftp address. You can change it to http address accordingly. For this purpose, you can host a subdomain to your server and use it as http://sub.domain.com/directory/file.format.